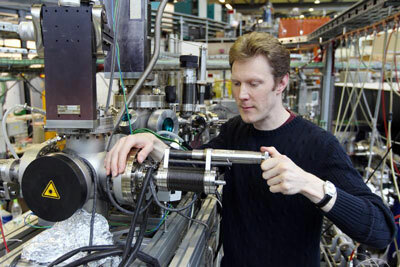 (Nanowerk News) Christian Stamm and his colleagues at the Helmholtz-Zentrum Berlin für Materialien und Energie (HZB) can look back on six years of pioneering work at the synchrotron BESSY II. They have set up a unique experiment on so-called femtoslicing, and are now publishing a result obtained in collaboration with an external user group. Together with their colleagues from Strasbourg, they report in the upcoming issue of Nature how fast the magnetism of a material can be influenced. “The ultra-fast processes contributing towards the phenomenon of magnetism can only be revealed by femtoslicing,” says Christian Stamm explaining the enormous effort it took the several HZB researchers to set up the experiment at the Berlin synchrotron source BESSY II. They fire ultra-short laser pulses at electrons moving at close to the speed of light in the storage ring. The electrons struck by these pulses subsequently differ from those that do not encounter the laser beam. The X-ray light these electrons emit during their cycle through the storage ring – the special synchrotron light – now also bears the characteristics added by the laser light. Finally, the magnetic sample is studied using these ultra-short X-ray flashes. What is special about BESSY II is that it is the only place in the world where users will find circular-polarized X-ray light for slicing experiments. And this is absolutely essential for studying spin and orbital moment – the phenomena underlying magnetism. The results Christian Stamm and his colleagues produced with their femtoslicing experiments provide a fundamental insight: “We were able to demonstrate through what path and how fast the added energy gets into the electron spin,” says the physicist. And ultimately how fast magnetism can be controlled from the outside.